Applesauce produced by Snokist Growers of Yakima, Wash., was recalled from the nation's schools earlier this year. Now, FDA officials say the company cannot ensure the safety of moldy applesauce reprocessed and packed in units such as this 106-ounce can. A Washington state fruit processor that supplies the nation’s schools and a baby food maker is under scrutiny by federal health regulators for repackaging applesauce contaminated with several kinds of potentially dangerous, multi-colored molds, msnbc.com has learned. Food and Drug Administration officials this week posted a warning letter to Snokist Growers of Yakima, Wash., saying the company cannot ensure the safety of moldy applesauce and fruit puree that has been reconditioned for human consumption. Products recalled earlier this year by Snokist were blamed for illnesses of nine North Carolina children who became sick after eating applesauce at school. The latest warning came after FDA officials said Snokist failed to adequately address problems identified during a June inspection in which regulators found large, laminated bags of fruit products that were supposed to be sealed and sterile, but instead were broken open and tainted with white, brown, blue, blue-green and black mold. Some of the compromised bags were bloated and one had “a strong fermented odor,” the report said. The FDA’s letter identified at least eight instances last year in which Snokist had reprocessed the moldy applesauce into canned goods for human consumption. The inspection report said Snokist documents showed the company had reprocessed mold-contaminated applesauce at least 13 times between January 2008 and May 2011, repackaging food into 15-ounce cans, 106-ounce-cans, 300-gallon bags and 4.2-ounce, single-serve cups. It's not clear whether the mold-tainted applesauce went to schools. However, the June inspection followed a voluntary recall of more than 3,300 cases of canned Snokist applesauce in May after North Carolina schoolchildren became mildly ill after eating the fruit product. The recall was blamed on faulty seals on cans. The children have since recovered. Snokist officials admit that they “rework” some moldy food for future use. But in an e-mail to msnbc.com, company officials said that the contaminated fruit represents only a fraction of the company’s products, that compromised product is typically separated and destroyed, and that any reprocessed food is heat-treated to kill toxins. “If rework occurs, our thermal process is more than adequate to render the product commercially sterile,” Tina Moss, a company spokeswoman, wrote in an e-mail. The company said it has begun testing for patulin, a common toxin produced by mold in rotting fruit. However, the FDA said the company's tests are not adequate and that officials must prove they're testing for other dangerous microbes: “Most mycotoxins are stable compounds that are not destroyed by heat treatment,” the letter said. FDA regulations to allow companies to "recondition" food, but the final product must be free of contamination. Firms aren't required to notify the agency they've reprocessed food unless they're required to under terms of an inspection or other action, such as an injunction. In addition, rules prohibit mixing contaminated product with sound product to get to acceptable levels of filth, said Pat El-Hinnawy, an FDA spokeswoman. A 2009 consultant’s report showed that the types of molds in the Snokist fruit products included Alternaria, Fusarium and two types of Pennicillium, all of which can cause illness in people. That report was commissioned by Snokist after a baby-food manufacturer returned dozens of bags of the company’s fruit product in 2009 because they were contaminated with “a large amount of mold,” according to the FDA inspection report. In early 2010, the consultant recommended six steps that Snokist could take to fix the problems, but during the FDA’s June inspection, company officials said they’d implemented only two. Snokist sold more than 3.3 million cases of processed fruit with sales of $53 million in 2010, according to the company’s annual report. That represents more than 50,000 tons of processed fruit. 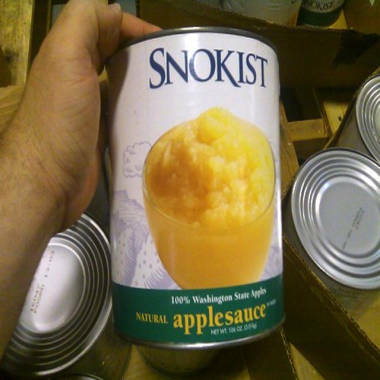 In the past, Snokist has supplied applesauce to schools nationwide through federal nutrition programs, according to the U.S. Department of Agriculture. A spokesman said he couldn’t comment directly on whether Snokist had been removed from the program, but added that no firm under investigation by the FDA would be allowed to participate. Snokist officials said they were working to address all of the concerns raised by the FDA and were awaiting a new inspection to confirm progress. FDA officials said the company has 15 days to respond to the warning letter.